Animal Farm: 50-Word Prereading Crossword—Great Warm-Up for the Book! This crossword contains 50 challenging words from ANIMAL FARM. Either as a homework assignment or by allowing students to work in pairs with a thesaurus in class, it's a great way to prepare students for reading the book and understanding the story. FYI: This puzzle includes the 25 Words to Know from the companion product ANIMAL FARM edition of BOOKMARKS PLUS. Students can refer to their bookmarks for definitions as they read the story as well as to a list of main characters, author information, and more. Students and teachers alike love these handy, 4-star-rated reading aids! Also, to reinforce meaning even more, I have created a synonym/antonym crossword over the 25 words. See list below. Visit my store to receive a FREE Bookmarks Plus edition of ANIMAL FARM! Like my products? Take a look at my new LOOKING GOOD ON PAPER line. Great writing lessons, some barely touched on in textbooks--all based on my years of teaching writing "in the trenches"! More unique products over ANIMAL FARM! View all 14 in my store! •	ANIMAL FARM: 12 Cryptograms—Encoded Quotations from the Novel! Students decode 12 thought-provoking quotations from the story! Each cryptogram puzzle has its own code. Who doesn’t love a code? 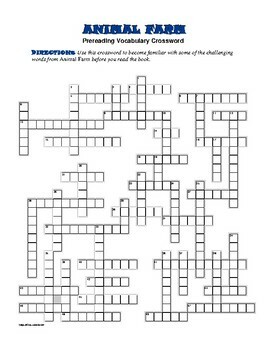 •	ANIMAL FARM: 2 Vocabulary Crosswords—A Fun Way to Learn New Words! Students provide synonyms for challenging words from the story. Good extra credit activity! 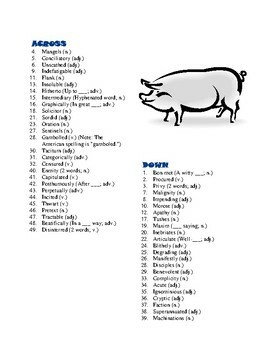 •	ANIMAL FARM: 4 Fill-In Word Puzzles—Good Trial-and-Error Exercise! Students enter common words from the story into the puzzle grid based on the number of letters in the word. These puzzles can be challenging, but each time students enter a correct answer, they are provided with clues for the next.